The Ameriwood Home Condon Desk is the perfect size for any home office, dorm room or bedroom with its small footprint but extensive amount of storage space. The Condon is sized at 30.1"h x 45"w x 19.5"d making it easy to fit in almost any space. This Desk features a smooth top surface for your laptop, lamp and office supplies and also offers 2 open side shelves for notebooks and binders. The large bottom drawer can be used as a file drawer, accommodating letter sized file folders and documents. The beautiful craftsmanship of the square metal legs separates this desk from others and will look stunning in your home. 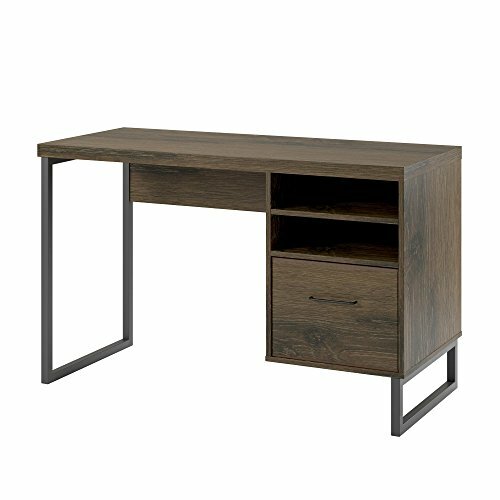 A textured distressed, medium brown finish accented by the black metal legs and a small handle gives this desk a sophisticated look. The desk is constructed of laminated particleboard, MDF and features powder coated metal legs and a handle for a long lasting value. Ameriwood Home Condon Desk requires assembly upon delivery.